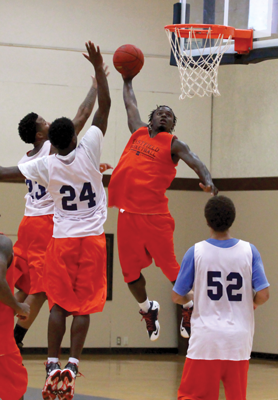 JONATHAN WENCES/THE ET CETERA Darius Jones, right, blocks Denzel Whitnon at a practice game in the Eastfield gym. First-team All-District. District Most Valuable Player. High school state champion. These are just a few of the accolades won by the players on the 2014 Eastfield Harvesters basketball team. Yet when their high school careers were over, no scholarship schools gave any of them a chance. “These players are trying to go out and prove them wrong,” Eastfield coach Anthony Fletcher said. Fletcher is hoping that hunger translates into another trip to the NJCAA national tournament, where the Harvesters have finished in the top five the past two seasons. 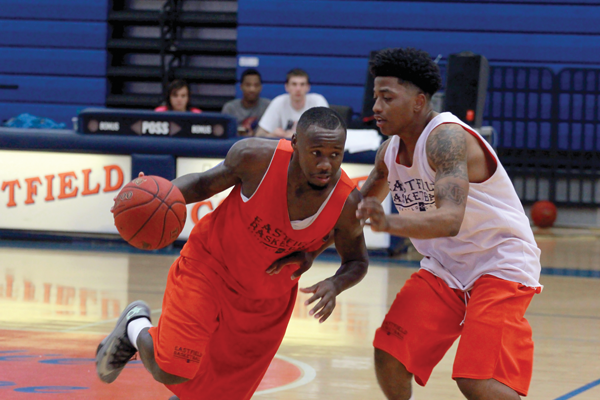 As it opens the 2014-15 season this week, Eastfield is faced with replacing practically its entire 2013 team, including Region V MVP Andrew Maxie and All-National Tournament team member Ricardo Artis. Yet the Harvesters are still ranked fourth in the nation in the preseason poll. Sophomore shooting guard Walter Bell is the only player returning from last season. He came off the bench to average 5 points per game with limited minutes in 2013-14, but Fletcher said Bell will likely be a starter this season. De’vincent Brooks dunks the ball before his teammates during a practice game. Two other players who have been part of the program but will be looking to contribute on the court for the first time are 6-foot-7 power forward Youssef Kaoud, who was recently named one of the National Junior College Athletic Association’s top newcomers this season, and redshirt sophomore point guard LaDaniel Marshall, who is returning to the team after sitting out last year as part of a maturation process that included refocusing on his academics. Kaoud, who is originally from Dubai, spent one semester with the team before going home and then returning this semester. He only has one year of high school experience in California, yet he has already impressed his teammates and coaches. “He’s scoring the ball well, rebounding well and blocking a lot of shots,” Bell said. Several newcomers have also been impressive in the preseason. Freshman point guard Majycal Howard has a chance to make an instant impact. Chadd Dansby, a 6-5 combo forward who is a former football player, and 6-6 freshman power forward Christian Brooks will look to use their long frames to help the Harvesters’ inside presence. After coming close to a national title the past two years, the team wants to take the next step this season. Last season the Harvesters were 27-8 overall and 7-3 in the Metro Athletic Conference. They led the nation in scoring, averaging 103.9 points per game, and ranked in the top 10 in rebounds, assists, steals, blocks and points allowed. If this season’s team is as dominant as that team, the Harvesters could have a third consecutive postseason run in them. Fletcher compares his up-and-down fast-break system to John Calipari’s system at the University of Kentucky, where players are given plenty of freedom to play an up-tempo style. Before the Harvesters get to the national tournament they will have to get out of the Metro Athletic Conference. A MAC school has played for a national championship in five of the past six seasons, and three have won national titles. North Lake won the national championship in 2008, Richland in 2009 and Mountain View in 2011. Cedar Valley lost in the 2012 national championship game, and Eastfield lost in the 2013 national title game. The Harvesters will open the season with four home games this week. They were scheduled to play God’s Academy on Tuesday night and will play CYM Prep Academy at 7:30 p.m. today. They have two games against Victoria College scheduled for 6 p.m. Friday and noon Saturday. ~ Carolina Catalan contributed to this report.